The Aico Mains Power Optical Smoke Alarm runs on 230V AC mains power and has built-in tamper proof cells that act as a battery back-up in the event of mains failure. These rechargeable cells have a ten-year life, outlasting the life of the smoke alarm itself, and can provide up to six months of smoke alarm operation without mains power. 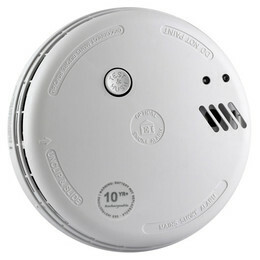 When adequate smoke enters the alarm, the Aico Mains Power Optical Smoke Alarm gives a fire warning and can be controlled by either a 'Test, Silence and Locate' switch or a Manual Call Point and can be interconnected with up to 20 Aico Mains Alarms so the whole system can be controlled remotely. The Aico Mains Power Optical Smoke Alarm is supplied with an Easi-fit base that allows for quick and simple installation combined with simple alarm head removal and replacement. The Aico Mains Power Optical Alarm can also be fitted using the EI68RC RadioLINK base to enable a comprehensive system without the need for cabling between any alarms. Other advanced features in the Aico Optical Smoke Alarm include built-in circuitry to aid suppression of voltage transients and RF interference to further reduce the chances of false alarms.